Nadja Verena Marcin's video installation Ophelia Floating. The New York-based German artist Nadja Verena Marcin brings her original interpretation of the dramatic character of Shakespeare’s Hamlet to The Minnesota Street Project, in San Francisco. Inspired by British artist John Everett Millais painting of Ophelia, Marcin’s project is both a live performance and a video sculpture (on view through March 31) about the painful awareness of the human destruction of the biosphere coupled with a dive into the history of female hysteria that also speaks to the democratizing power of the meme. “A couple years ago, on a layover in London, I went to the Tate Modern. Strolling through the masterpieces, I didn’t expect anything, but there was one painting that truly spoke to me: Ophelia by Millais. It captured me so deeply that I kept on thinking about its relevance and wondering how it could be so timely. What triggered me specifically was the parallel between trauma, silencing, emotions, instincts, nature, femininity and loss, the psychological interior of the image” says Marcin. 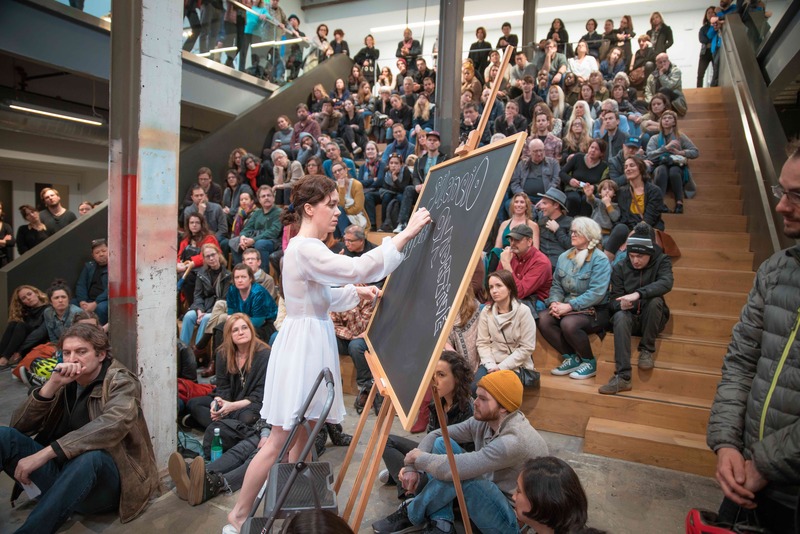 At the beginning of the performance, the artist dressed in white walks around the atrium of the Minnesota Street Project quoting sentences from The Werld by Russian author Daniil Kharms about the limitations of our human subjective before writing words and phrases, like “self-destruction, silencing of women, silencing of nature,” on two different blackboards. Nadja Verena Marcin during Ophelia’s live performance at Minnesota Street Project in San Francisco. In the second section of the live show, Marcin immerses herself in a life-size stainless steel sarcophagus. While floating in a salt-water solution elevated on legs—in reference to the Three Ball Total Equilibrium Tank by Jeff Koons- she wears a breathing mask. “The transparent glass sarcophagus signifies the end and the beginning. Reenacting Ophelia’s final moments, I am specifically interested in the survival of Ophelia, her resurrection—Phoenix-from-the-ashes style. Collapsing distinctions between time and dimensions, my meme stands in for the painted Ophelia (missing inside the backdrop). I juxtapose the futuristic, technological dependent Ophelia of the 21st century (on life support via breathing mask) with impending demise of Ophelia by Millais’ lushly painted nature-scene. The ritualistic course of the performance is a reflection on nature versus technology—the jungle of technology, versus the power and vitality of nature,” said the artist. Awarded a Franklin Furnace Grant and supported by a Kickstarter Campaign, Ophelia is traveling for two years (2017–2019) around the world. After San Francisco, Marcin will perform in Santa Cruz (Bolivia), Berlin, Stuttgart, Cologne, and Rome in a series of art event and locations.